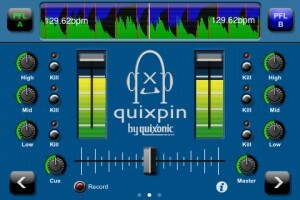 Using a multi-screen approach and opting to move away from a traditional 2-deck interface, Quixspin makes better use of the screen real-estate for easier mixing. There is one screen for each channel and a mixing desk screen in between them both, which actually makes mixing a little easier. It is missing the more advanced looping and cueing features found in some of its competitors, but it is still a useful mixing app for a good price.